I previously wrote about a known issue with Silverlight Streaming services and videos encoded with Encoder 2. The quick recap is that a video already encoded to VC-1 using Encoder 2 will not process when using the Manage Videos feature of Silverlight Streaming services. I provided 3 work around options (#3 being the easiest of those 3) to get you past the issue and get the video uploaded. 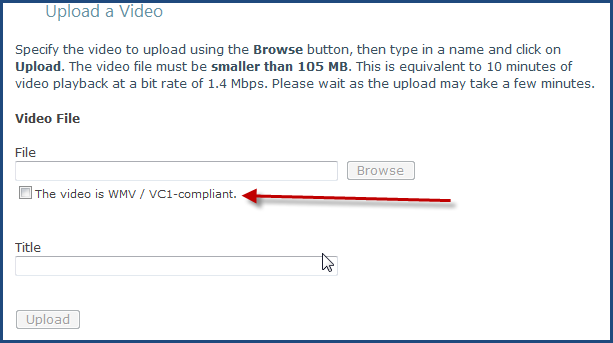 Notice the new option of The video is WMV / VC1-compliant. (It should actually read VC-1 to be picky, but I digress.) Here’s what you do if your video is already VC-1. This only applies to this situation…if you still want to use the transcode service, feel free with your AVIs, etc. First, click that checkbox first. Do this before you browse the file to set the flag that you will be bypassing the transcode. Then browse to your file, give it a title and upload. I hope this helps get around this issue the team identified. Thanks to the SLS team for implementing a better work around in a short time after the problem was identified.